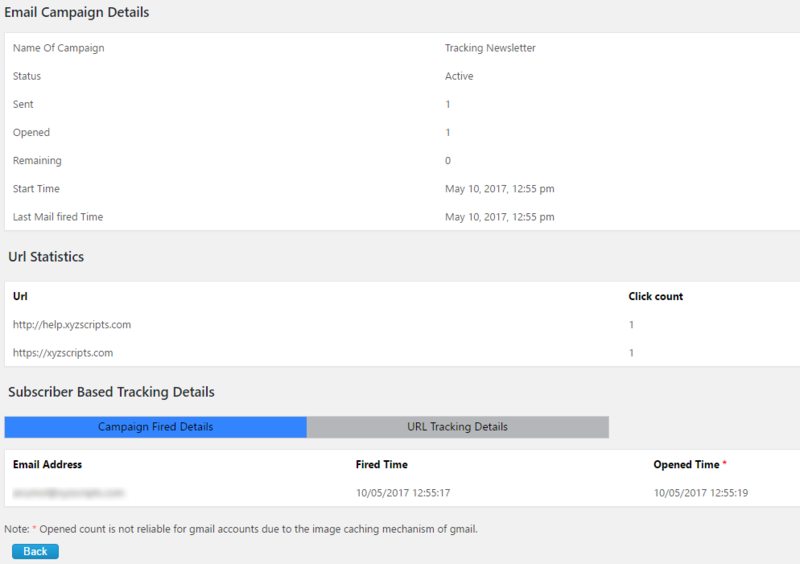 We can see the tracking details in the “Manage Campaigns” page. In this page we can see the mail opened count also. But please note, the opened count is not reliable for gmail accounts due to the image caching mechanism of gmail. To see the complete details, click on the “Tracking Details” button. Here we can see the complete tracking details. Here we can see the status of the campaign, sent, opened and remaining count, start time and last mail fired time. Also we can see the url statistics like urls in the campaign and the click count. Similarly we can see the subscriber based statistics like fired time and opened time. In the URL tracking details section we can see who clicked on the url and the url open time.